The burrow-nit family currently consists of solely one confirmed member, the Cloaking Burrow-nit. Although unconfirmed, it is possible that the Joustmite and the Flighty Joustmite also belong to this family. The Cloaking Burrow-nits is in the genus Trilobitens, while Joustmites are part of an unknown genus, though possibly the same one. The Cloaking Burrow-nit is an enemy in Pikmin 2. This predator features a hard shell with eye-like markings covering its backside, leaving its face exposed. It burrows under the earth with its shell aboveground, and when prey get near, it unburrows and attempts to stab them with its proboscis. The Flighty Joustmite is an enemy in Pikmin 3. 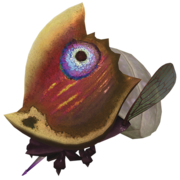 It is identical in appearance to a regular Joustmite, but has a red colored shell and small wings with which it can fly in the air. Because of this, it can stab downward, and occasionally its proboscis can get stuck in the ground. Its weak point is on the back of its shell as well. Rock Pikmin are immune to being stabbed with its proboscis. 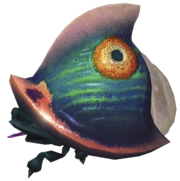 The Joustmite is an enemy exclusive to Pikmin 3. Its weak point is behind it, while the weak point of the Cloaking Burrow-nit is the face. Its stabbing attack is useless against Rock Pikmin. This page was last edited on April 15, 2019, at 16:31.